No hardware required to keep it together! With our design, gravity does all the work for you! 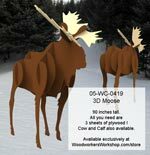 Our 3D moose is nearly LIFE SIZE and only requires 3 sheet of plywood to get this project made. A perfect way to get people to stop and stare as they pass by. FULL SIZE drawings! Custom sizing available. Moose Pet Pin Scrollsaw Woodworking Pattern. Our moose antler rack silhouette pattern spans 36 inches across. Mount on a indoor or outdoor wall, like the side of a building. Full size drawings. Custom sizing available. Our sheep antler rack silhouette patterns span 20 and 30 inches across. Mount on a indoor or outdoor wall, like the side of a building. Full size drawings. Custom sizing available.